In what may be a first for the American legal system, Wikileaks—the radical transparency organization turned Russia propaganda cell run—was served a lawsuit today in a tweet by law firm Cohen Milstein Sellers & Toll PLLC. The firm, which has not tweeted from this account before or since, appears to have created it specifically for this purpose. Cohen Milstein Sellers & Toll is retained on behalf of the Democratic National Committee, which had troves of information exfiltrated during the 2016 election that was then strategically disseminated by Wikileaks and its self-exiled leader Julian Assange. That case, first filed in April to the U.S. District Court for the Southern District of New York, also names the Russian Federation and GRU (Russia’s military intelligence directorate), the hacker or hackers known as Guccifer 2.0, Donald Trump, Donald Trump Jr., Paul Manafort, Roger Stone, and others. Last month, the Justice Department charged 12 Russians military officers for their alleged role in hacking the DNC and distributing the organization’s emails and other documents. The DOJ claims the Guccifer 2.0 persona, which publicly distributed many of the documents, was run by the GRU. The DOJ also alleges that GRU operatives gave the stolen DNC documents to an unnamed “organization,” widely believed to be WikiLeaks. Within 60 days after service of this summons on you (not counting the day you received it) you must serve on the plaintiff an answer to the attached complaint or a motion under Rule 12 of the Federal Rules of Civil Procedure [...] If you fail to respond, judgment by default may be entered against you for the relief demanded in the complaint. You also must file your answer or motion with the court. While this may represent a break from standard legal procedure (searches for similar uses of Twitter turned up no meaningful results), it’s a somewhat poetic way for Assange and Wikileaks—prolific users of the platform—to be served. 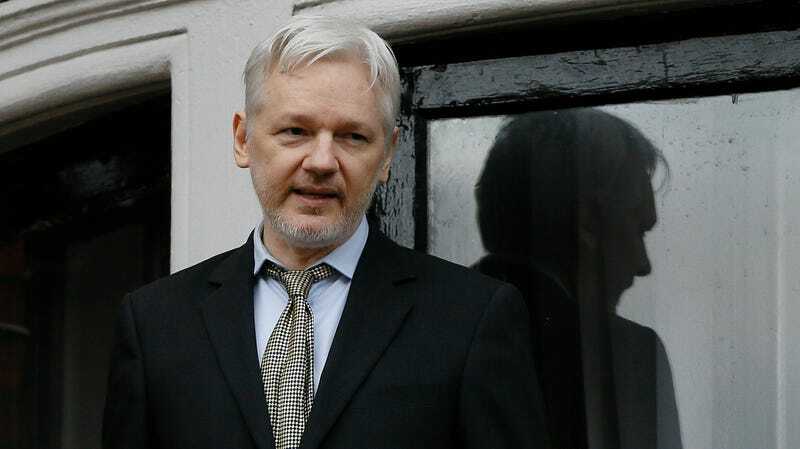 Assange is currently living under asylum at the Ecuadorian embassy and London—an arrangement that may soon end. Cohen Milstein Sellers & Toll declined to comment. We’ve reached out to Wikileaks for comment and will update when we hear back.